In the past several months, many museums have begun using live video chat as a way to enhance and foster new online discussions and interactions between museum educators and the public. 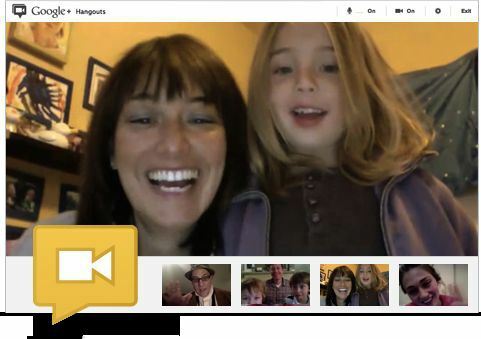 One of the most popular tools has been Google Hangouts which is part of the Google+ social network. It allows for up to 10 users to video chat together and gives them the ability to broadcast the video stream live to a large audience and even record the session for future viewing. The recorded video, which is archived on the museum’s G+ page and YouTube channel, can be shared on various social networks. In addition, the videos collect (limited) analytics information so museums can track the attention it receives. Users who express interest in a museum video session ahead of time can be alerted when it is about to begin via Google+ email messaging. This use of video chatting has spawned a new online forum that helps to bring together museum curators, directors, historians and educators with different virtual communities for in-depth conversations of art and ideas. Rather then a YouTube video, which disseminates information in a “I talk, you listen” format, video chatting can enable a more flexible and collaborative seminar style discussion. This idea of accessible online videos is very much in keeping with many museums’ mission of providing an open space for dialogue, learning, and exploration for the public, and working toward developing meaningful online communities of practice. Though relatively new, there have been a large number of museums using Google Hangouts from all over the globe. This past month alone, MoMA debuted its “Art Hang” series, which brings together art educators with other art enthusiasts to discuss topics surrounding art and identity. The Google Art Project began its #ArtTalk hangouts with the National Gallery on March 20th and more recently with the Metropolitan Museum of Art. The series, which discusses the stories behind famous works of art, will continue to take place each month at different cultural institutions such as the Museo Nacional de Arte in Mexico and the Museum of Islamic Art in Qatar. Hangouts have also been leveraged in several other artistic ways. For example Google Brazil has used hangouts for their street art campaign, where artist Felipe Iskor created a mural live. Likewise artists have conducted live studio visits, in which they talk with interested online groups about what inspires them, what their next artwork might look like, and get much needed critical feedback from online art communities. Of course, use of a new medium brings new challenges. In trying to gauge the success of video chats, museums are learning how to interpret the relatively sparse analytics information provided by Google+ and YouTube. Statistics like “this video was viewed 5000 times” does not paint a full picture of just how beneficial the video was for the museum and its viewers. It is very clear, however, that hangouts have the ability to reach far greater percentage of the global online community and can do so in a more engaging way. And while it can be difficult to measure the success of these videos, museum educators know it is worth their time to continue exploring the limits of new this technology in order to captivate a broader audience and share more of the museum’s passion for art and cultural heritage. Tools associated with video chatting such as live commenting, image sharing, hash tags, and social media sharing have become additional ways of connecting online viewers with the live discussion. Recently, Mike Murawski of the Portland Art Museum brought up another possible use for video chatting. He suggested using Hangouts as a way of connecting living contemporary artists with museum visitors both in the gallery and online. What would it be like then to talk with an artist about his/her work right in front of the artwork in the gallery? 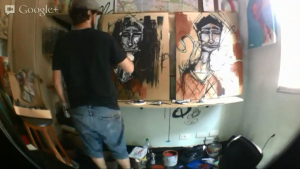 Or watch an artist explaining his/her artwork online while you ask questions? How can we use these new tools to better facilitate learning and interaction onsite and online in the future? Are there other ways that Google Hangouts or other chatting services will connect people, or perhaps help the museum’s visitors feel closer to its collection? Taking this question further in a mini-thought experiment, imagine what would happen if the video feed were not fixed to the wall. What would a more intimate conversation with an artist look like? While you ebb and flow around the gallery, could an artist virtually tag along with you? In the video above, I created a roving avatar robot with video screen projecting the face of a remote participant. 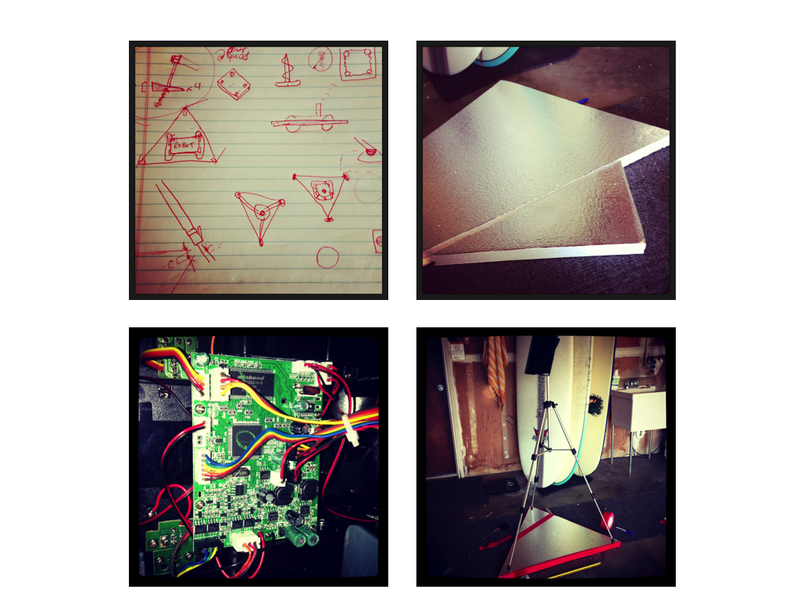 The robot is built on a tank like structure (images below) that is controlled remotely by a person on the computer and reacts to speech frequencies. While video chatting environments will continue to develop (though at the moment we are not yet sure in what form they will appear) the strides taken by #ArtHang, Google Art Projects, and many other institutions and artist communities will continue to push online connection and conversation.